MUMBAI: Leading IT Peripherals and consumer electronics company, Zebronics India Pvt. Ltd, which also has a wide range of Bluetooth speakers meant for the discerning audiophiles has proudly come out with a fascinatingly unique product. ‘Amplify’, as it is christened, is a wireless audio amplifier induction speaker. Weighing just about 330 grams, this portable and lightweight induction speaker uses induction technology to amplify the sound, giving a clear and powerful output. Without the need of bluetooth or Wi-Fi pairing between the mobile and the speakers, the induction speaker can easily pump out the tunes. Easy to use, the induction speaker has to be turned on and the mobile has to be placed on the mobile holder of the speaker. This amplifies the sound manifold and augments the music listening experience. The product is compatible with most of the smartphones and is launched primarily for the young and tech-savvy music fanatics. “Music lovers, these days, prefer taking a leap from the existing methods of playing music. They are averse to the use of wired speakers, and even look for solutions beyond connecting through bluetooth or Wi-Fi. This motivating us to launch ‘Amplify’, the unique Drop & Play wireless speaker,” said Zebronics director Pradeep Joshi during the launch of the product. The trendy looking speaker sports a rubber finish, and comes with a rubber grip at the bottom as well. With a Li-ion battery and a capacity of 1000 mAh. The playback time through induction mode and aux mode will be between 6 and 8 hours, extending the fun-time of music lovers. ‘Amplify’ is priced at just Rs. 999 and is available online and brick-and-mortar stores across India. 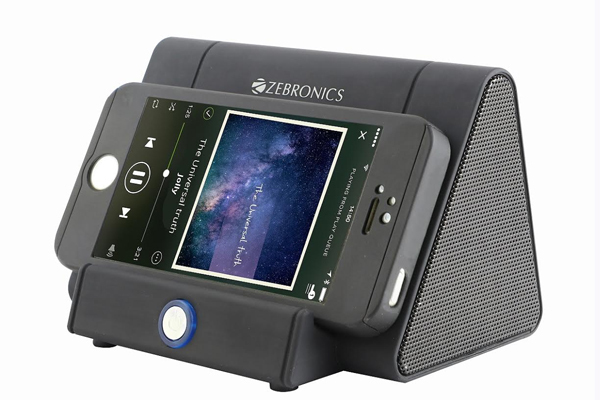 MUMBAI: Zebronics, India's multimedia speakers brand recently launched two new speakers in India.